Yesterday, HubSpot, the creator of the term “Inbound Marketing,” filed for an IPO. When a company files for an IPO, they submit what is called an “S-1,” which provides financial information for prospective investors. It was our first detailed look into the financial health of HubSpot, and after reading it pretty carefully, I am left with a provocative question. Maybe you will be, too. Hubspot has been around since 2006, and their S-1 details financial information from 2009 through the first two quarters of 2014. Still a startup, yes – but after 8 years and several rounds of funding, a fairly mature startup. I was mildly surprised to see that they are still losing significant amounts of money – last year, they lost 34 million on revenues of 77 million. Now, there are a wide variety of reasons for a startup to be in the red, even after eight years. You can look at Amazon’s profits (go ahead – I’ll wait) and see that. Within what might be loosely considered Hubspot’s competitor and peer group, the results are also mixed: ExactTarget in 2012 lost somewhere around 21 million on revenues of some 292 million (and was purchased by Salesforce.com); Marketo lost 46 million on revenues of 94 million in 2013. But HubSpot is based upon a principle: The efficacy of Inbound Marketing. So what can their S-1 tell us about the efficacy of the approach they championed? 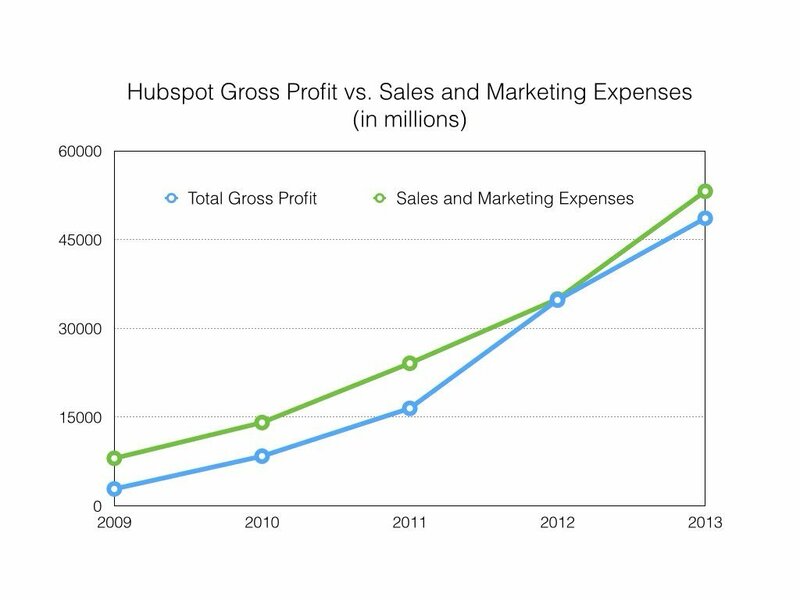 What can Hubspot’s financials tell us about the efficacy of inbound marketing? While it seemed as if the line was trending in the right direction in 2012, 2013 saw sales and marketing expenses increase again, and that trend is holding for the first six months of 2014. I am not an equities analyst. I do have an MBA, and am an investor. I have had exactly one startup. It didn’t do so well. I have friends at HubSpot, and the question I am about to raise is not an indictment against them. They are good people. HubSpot is based on the principle of Inbound Marketing. HubSpot is arguably the world’s greatest practitioner of Inbound Marketing. The quality and velocity of their content marketing is formidable, and almost without peer. HubSpot is also supplementing their inbound marketing with tons of display, video and other advertising. Inbound marketing is supposed to drive acquisition costs down. Yet, even with (or perhaps because of) the addition of outbound marketing, HubSpot’s own sales and marketing costs continue to outstrip their gross profits. Now, before I ask my provocative question, let me point out that the S-1 does not break down sales and marketing separately, so we cannot definitively say that their marketing costs are rising – merely that the costs for acquiring and retaining customers are rising. And let me also stipulate that HubSpot can still be considered a startup, and the fact that customer acquisition and retention costs are causing losses is par for the course, not an outlier. Further, a ramp up in sales and marketing expenses immediately prior to an IPO is not unusual, per se. But at some point, we should expect that to change. And if you are a with a company that is also focusing on Inbound Marketing, HubSpot’s performance might suggest that a rapid path to profitability is surely not in the bag. Finally, we also do not know the differential ROI between Inbound and Outbound efforts for HubSpot, though the necessity for the latter surely speaks to the limits of the former. 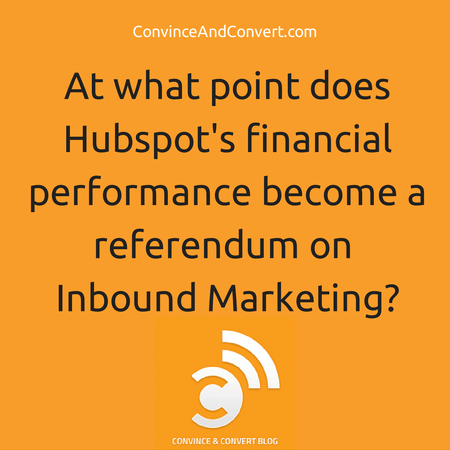 At what point do we consider HubSpot’s financial performance a referendum on the efficacy of Inbound Marketing? This question, of course, assumes that HubSpot has a product that people want to buy, and are willing to pay money for – after all, Inbound Marketing can’t put lipstick on a pig. If it’s not a pig – and given their consistent increases in customer counts, it would appear to be a non-swine – what conclusions can we draw? What do you make of this data, given that Hubspot’s own State of Inbound Marketing report (2013 edition) found that proving ROI is the top marketing challenge for inbound marketers, cited by 25% of their survey respondents? But what I do hope to do is to start a dialog about challenging the received wisdom of inbound marketing – making it “hype-free,” as my good friend Jay Baer would say, and really holding its feet to the fire to measure exactly what it does, and make it better.